Nelkin Designs Blog: A Sock Celebrating Giveaway! I am lucky enough to have met, and spent time with, the lovely Miss Chrissy Gardiner of Gardiner Yarn Works when I travel to trade shows with Schaefer Yarn. I've become quite a fan of her patterns and aesthetic sense! So when Chrissy mentioned I could do a give-away of her comprehensive Toe-Up sock book I just had to say yes! I've decided to rope Schaefer into it as well, so I have 2 book and sock yarn care packages to give-away. The Book: First off, I LOVE how this book is set up. The first chapters discuss sock anatomy, and technique IN DEPTH. I particularly love the chapters on Cast On's and Finishing Techniques. Chrissy has very clear and easy to understand instructions accompanied by pictorial tutorials that help clarify the "sticky" points. Then you get to the worksheets, and that is where it all really comes together. My favorite kind of knitting books are ones that nurture and develop independent knitters. Toe-Up is definitely this kind of book! The worksheets and their uses are illustrated in the beginning of the book and then "blanks" are supplied in the back. So, once you've learned about the different toe and heel shaping that Chrissy has outlined you can go ahead and figure them out for your gauge, size and pattern. What freedom! One other thing that has to be mentioned is how BIG the charts are! You won't need to blow these up at the copy place before being able to get to work on them. I love that Chrissy used a little extra paper and ink to give us knitter's something readable! Finally, I have to say something about the designs. I am quite drawn to many of them, but the one I am casting on for SOON is the Old-School Knee-Highs, I absolutely have to have them in my wardrobe by next Fall. I love the shaping at the back of the leg. I'm just worried that my girl is going to fall in love with them too and a steal them from me! The Yarn: The yarn is Schaefer's Nichole perfect for jumping right into learning with Chrissy's book. Leave a comment by March 10th, letting me know just why you think these goodies should be yours for a chance to win! Feel free to Tweet and share on Ravelry, the more the merrier! If you do tweet or mention the giveaway on Ravelry, leave a second comment and I'll enter your name twice. After knitting babyclothes and gifts, it is time for ME and I need socks! Thank goodness my feet are way bigger than my girl's and probably always will be. No sock sharing for me! I've knitted quite a few pairs of socks, but I haven't yet ventured into toe-up construction. I've heard great things about Chrissy Gardiner's socks, so this would be the perfect book to use. And, of course, free yarn never hurt anyone. a book with charts big enough to read?? I must see this! and I was just thinking I needed more handknit socks. My fiance is a sock fanatic. He loves high-quality socks and will gladly spend $10-$15 for a pair. However, with the proper knowledge, the $10-$15 can go for yarn to entertain me and THEN to satisfy his sock-y-ness. i have a need to conquer my fear of toe-up socks! this might help? I need to try toe up socks...I just keep putting it off...this would be a great motivator! I do almost exclusively toe up magic loop socks. I'm always on the hunt for creative toe up patterns. Can't wait to get my hands on this book!! If I'm not knitting socks, am I really knitting? Certainly I owe myself some serious sock time as soon as I finish an Accursed Boyfriend Sweater: nothing but ribbing on #4 needles, color--tan. I was so excited at your first couple of sentences, just to win the book filled me with goose bumps! By the time I got to the end I nearly lost my coffee cup! I would be thrilled to win the book, adding the yarn is beyond! Thank you for this wonderful offer! I'm ready to test the waters with toe-ups...always looking for something new to try. Thank you for sharing! Post in the Summer Mothers 2009 group on Ravelry! I made my first pair of socks last month using an online toe-up pattern. I would LOVE to win the book and yarn to add to my knowledge of knitting socks. It seems like there is so much to learn, and so many skills to perfect. Thank you for the chance to enter the drawing! I'm still trying to crack this sock-knitting malarkey and keep getting the foot size wrong. I need, need, NEED to learn toe-up socks. I'm a big fan of Schaefer--their colors are gorgeous! And I used to live near Interlaken so I feel an affinity. :-) Would love to win some goodies! Toe up is the only way to go when your DH wears size 11.5 EEEE shoes & you've got your own surgically repaired toes to accommodate. Schaefer yarn = gorgeousness! What a winsome combo: this cool book AND this decadent yarn. I just learned two-at-a-time toe-up using magic loop. This would be a fantastic opportunity for me to learn more, and as a person job hunting, a way to stretch my skills to boot! I've been looking for a cute knee-high sock pattern! This one looks perfect. And I LOVE knitting toe up socks but really don't have a good grasp of all the construction details. Thanks for the giveaway! LOVE knitting toe-up sox, LOVE Chrissy Gardiner's patterns - no matter where or how they're worn! I love toe-up socks and I need this bok to know more. Thank you. Chrissy book has been on the top of my wish list for a long while now. What a great classy giveaway. Did I mention that I don't believe begging is beneath me. PLEEEASE! Thank for enduring that. Cheers! These goodies should be mine because I am dying to learn to knit socks and have failed with traditional methods. TOE UP it is! I would LOVE to win this giveaway and (honestly), give the goodies to one of my best friends. She is a sock lover, and would LOVE this!! (Plus, she has been a super supportive friend when I've needed it most, and I'd love to give her something in return!). Thanks for the chance at winning something awesome like this!!! And I just retweeted about the giveaway!!! Thanks again!!! Methinks it is time I knit a pair of socks for me me me. I have made several pair to give away. Sounds like a new idea, a new book, and a new yarn would be just the thing. I've been knitting for years, am making my first socks, and loving it. I always liked that EZ gave the rational behind choices she made and it sounds like this book does the same. May I have a copy please? i have been wanting to try toe up socks so that i could custom fit my big feet. i would love to win the yarn and sock book. I'm buried under sock yarn! With this book, I can use that sock yarn! (well, at least an excuse to buy MORE sock yarn) And a chance to have more sock yarn sent to me? I LOVE sock yarn - send it my way!!! 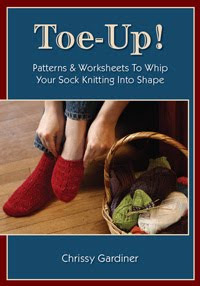 I want to try knitting socks this year and this book looks like a perfect starting point! I have a pile of sock yarn that needs to find homes. Toe-up is the way for me! I've been DYING to venture into sock knitting and this just may give me the opportunity. A lot of the books I've seen have made attempting it look scary but you've made it look like this book would make it so easy! And with some sock yarn it would give me a perfect chance! I lovelovelove sock knitting- it is the ultimate in portability and a quick-fix project for me. I love that a skein sock yarn takes up so much less space than a sweater's worth of yarn, and is still a whole project! I'd love to win- it looks like an awesome book, and the yarn is great too! I've never had a chance to knit with it because none of my LYSs have it in stock, so it would be so great to try it out! Like every manic sock knitter, I always have a pair on my sticks! And I need to win this book because I HAVE TO knit those Old School Knee Highs!!! I am knitting my very first pair of magic loop toe-up socks NOW, and I love it! Having this book to learn from and go wild with would be heaven! And such lovely yarn as well? Too good to be true! I love sock knitting but haven't yet dipped my toe into the toe up scene so this would be lovely for me! The book sounds really good. I have finally be able to move past the plain vanilla sock and love exploring ideas! I didn't tweet this, but I did put it on my facebook page! Hope that counts for a second entry! I have stockpiled enough sock yarn to make 30 pairs of socks .... now I just need to learn how to knit socks and this book would fill the bill quite nicely. These goodies should be mine because I've never knitted socks. This would be a great introduction. Oh, I really want to try to do toe up socks. This would be a perfect way to learn. Toe up is the only way to go when you have large feet. . . keeps you from running out of yarn (or not making your cuffs as tall as you would like for fear of running out of yarn). I have been eager to read this book. I love her designs and have never tried toe-up socks. this book sounds wonderful! my daughter and I are avid sock knitters, this would be a fabulous addition to our library and knitting abilities. Hmmmmmm.....Well, as a yarnaholic & knitting bookaholic, how can I resist a chance at a new and wonderful sock book, plus new and wonderful sock yarn????? I've declared 2010 as "The Year of the Sock," and I would love to learn to knit from the toe up. I must have this book - it sounds ideal for an obsessive sock knitter like myself, thanks for the competition! You give a very convincing review! I prefer to try a little of this and a little of that and then make my own way. This book sounds like it would be just right. I'm just getting back into knitting, I prefer toe-up and I'm fascinated with sock construction! I love to knit socks. I have been wanting to learn toe-up and this seems just the book to help me. I've just started knitting socks this past year and am in love with toe-up construction. I've slowly started adding to the stash and trying to catch up skill-level with my knitting group! this book could be a big help. i've done exactly half of a pair of socks (the feet, as opposed to the legs), and really enjoyed the toe-up process...........that being said, i would love more info on it, and something that i can take with me for reference!! this looks like a wonderful book, i've been looking at it online lately, but haven't had the cash to pick it up. I have some beautiful Nichole that needs a worthy pattern, and I have said that 2010 is the year that I venture into toe-up socks. Although I have knitted all my life, double pointed needles were a mystery to me for decades. I finally learned how to knit socks on dpn about 4 years ago. I knitted three pairs of socks on them. Then onto two circulars where I have made 4 more. And last week I finished a class in magic loop. I think my next challenge ought to be toe-up, don't you? I have some sock yarn in the stash with no specific plans. And I've never knit toe up socks before!! I think I should get this book because I have never done toe up socks and i think that this book will be very educational. I just got this book from the library! I think it might be a good one to purchase. I love toe-up and I think it takes less time. I would love to use this to make Xmas gifts for 2010! I'm halfway through my first toe-up sock and it's in time out. For the last year. I really need the help! I live in Houston, TX. Socks are just about the only thing I can knit and wear around here! Anytime I've followed a pattern for toe-up, it just seems to be too big and I frog it and go back to top-down. I want a good book that will clearly explain what I need to know. I would love to get the goodies because I am addicted to making socks, but intimidated by toe-up socks. It would be so great to have such a good guide for making toe-ups. logically follows that I would love a book on knitting socks. Especially one that is as detailed and thoughtfully worked as this one. Oooo, I'd love this book. I'm new-ish to sock knitting (only on my 3rd sock ATM) and haven't been brave enough to try toe-up. Sounds like this would be just the thing to make me "jump in with both feet", lol. I am just now knitting my first toe-up socks and want to learn more about this technique. I've never knit any of Chrissy's designs and the description of the techniques sections sounds perfect for me. Naturally, Schaeffer yarns are awesome!!! Oh my. That book sounds like exactly what I've been looking for. I've been looking for a book that covers toe up sock construction, you'd be surprised how hard that is to find. I would love to win one of these packages....because I have not done toe up socks yet. The book and yarn sound wonderful! I don't own a single knitting book, because I can never seem to justify the expense. But I'm at the point where I can do the basics (doing my first pair toe-up as we speak, having done a few cuff-down) and I want to get better, I want my stuff to look really classy, and I'm a learner-type. OMG, a sock design book which includes anatomy etc.? I gotta own that! I love interesting sock designs, and I would love to make my own, but I don't have the proper knowledge to figure out what suits your feet..
Because I'm about to do a *solo* move to another country - since my husband wono't be joining me for several months, there is a lot of knitting time in my near future. And since I'm moving from a semi-tropical climate to a much cooler one, warm socks will be much appreciated! In the warm weather I take care of my tootsies with pedicures and hand painted nail design. In the cold weather I take care of my tootsies with hand painted socks. I always invisioned that socks and gloves were too difficult to venture! But last year, I decided to give a pair a try! I laughed at myself, because I waited so long for something that was easy and fun! Now, I have been on the prowl for a nice book that would allow me to make a pair that would fit a larger calf! After reading your blog, I knew that this was the book for ME! Also, my birthday is next weekend...LOL!! I'd love to try socks, and I hear that toe-up are the best to step out of my knitting comfort zone in! I am new to sock knitting and need all the help I can get. Please choose me. I've been struggling with my first pair of toe up socks, and I have all sorts of sock yarn all over the house, just crying to be made into these patterns! That looks like a very interesting book - I hadn't heard about it before now and now I have to go look for it. Those socks look great and with two teenage girls in the house, I need to make some! I don't have this book! I've never tried any Schaefer yarns? Lots of sock yarn hanging around waiting to be knit up into socks. I would love the toe-up book because I have only knit one toe-up sock (not one pair - just one sock) and I think I need practice. Also, Schaefer yarns are gorgeous. I haven't knit with any but I would love to. I don't know if I deserve to win, but I'd sure like to. Chrissy's designs are wonderful and I've got some sock yarn weighing on my conscience. I think I should win these goodies because I've taken on the challenge of learning to knit toe-up socks this month. I've never knit socks and I dearly want to try so this would be my inspiration to do it. I really need a good book/books on sock knitting. I'm desperate to learn to knit socks toe-up. My last pair I ran out of yarn at about one inch of toe left to go on the second sock. If I had done toe-up, the disaster of a re-knit that followed would never had happened. I'd love to win the book. Toe-up is the only way to go IMHO. I love to try things on as I go, so I know it'll fit! Thanks for a great giveaway. To find a book that helps you work out the exact measurements for toe up would be great. I just finished my first pair and need a better understanding of the construction from toe to gusset to heel. I've started my first toe up sock, and it's going slow.... I don't quite understand it, or what I'm doing at the heel - Maybe, if I win this book, I'll figure out what I'm doing! Thanks for having the contest.. I have made 3 pairs of toe down socks this past year and am always annoyed to have leftovers. Would love to learn the theory before I try toe-ups and use a whole ball up on lovely well fitted socks. I bought some more sock wool just yesterday and dont want to waste any of that great merino! Maybe I'll finally manage some warm cycling socks for when I'm out on the tandem. i would love for some one to make a better way to do a toe up gusset heel... is it in this book??? I've knit socks exactly once, and wasn't pleased with the outcome. I've always wanted to do toe up socks. I would love to win! My ever growing sock yarn stash needs to become pretty long toe up socks. Don't want to waste any yarn since I don't see a sock yarn blanket in my future. I have tons of sock yarn... they always seem to come in the best colors! But I'm currently working on my first sock ever... heel out. Whew! I really love the idea of toe up socks and I think it would be super neat to understand construction better too! Oh, this would be perfect for me. I've accumulated WAY too much sock yarn without knowing how to knit socks and need a kick in the pants to learn how and get knitting. I need more socks and therefore, more sock patterns! I love books about socks! I really need to work on my understanding on how socks are constructed (following patterns blindly isn't horrible, but it's nice to understand why you do what when). Please count me in! My son's birthday is March 10, and I was just about to start a pair of socks for him! Maybe this will bring me luck! my first pair of socks came out super wonky, so i could use some help! I like making toe-up socks but I can't get the heel placement just right. Anything that would help me would be appreciated. I saw the pattern for "The dude abides" socks in this book, and would love to make them for Cathleen Falsani, author of "The Dude Abides: The Gospel According to the Coen Brothers". Plus I'm another one who loves the shaping on those knee highs! I've lost my sock mojo and am desperately trying to find it.... pink & purple sock picture helps! If the perfect heel is hiding inside that book I would LOVE to find it!! And charts that you can see once you slide over that 50 hill would be wonderful. Why? Because I love knitting socks and I can't right now. I'm being held hostage by a silk shawl with rows that are 300+ stitches long. So I read my sock books at bedtime and dream about the next pair. I am just now starting to learn sock knitting, i have been obsessed with the idea since i moved past scarves. Toes up really sounds like a no brainer way to start myself off into socks. The book and lovely yarn would be so helpful to get me going, but say, if i dont win your giveaway (which is awefully sweet of you btw...) i could always run out and pick up a copy myself. I have been knitting socks the same old way for the past 20 years and it is about time to learn new ways!